China plans to increase the share of non-fossil fuels in primary energy consumption to around 20 percent by 2020. (Yunnan, China) Photo by Mingjia Zhou/Flickr. With the historic climate announcement by President Barack Obama and President Xi Jinping, the United States and China joined the European Union in committing to new limits on greenhouse gas (GHG) emissions. These three economic powerhouses emit about as much each year as the rest of the world combined, so their commitments have important implications for the world’s ability to stay within its carbon budget. 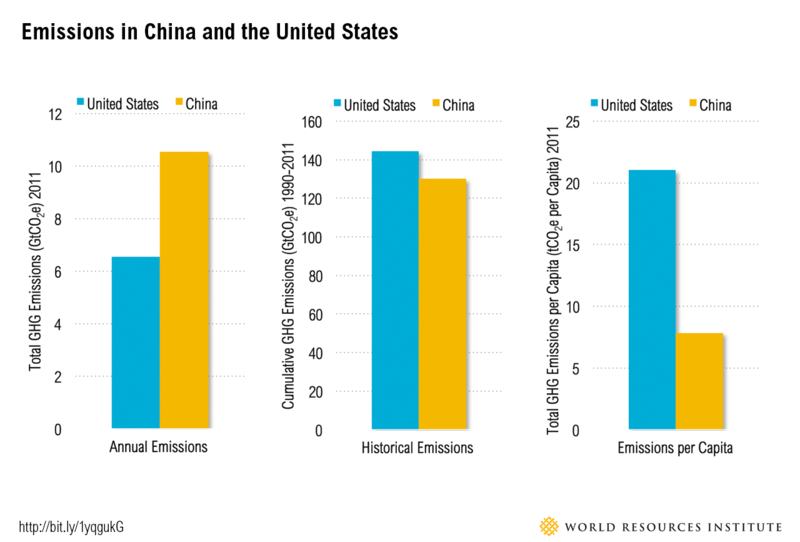 While China and the United States are at different stages of development – reflected in their historic and per capita emissions – the numbers suggest both countries’ proposed reductions are a meaningful deviation from business as usual. Further efforts will be needed, however, to ensure these targets are met and that ambition is enhanced. Below, we summarize what the targets mean for emissions trends in each country. What are the U.S. targets? Under its new targets, the United States will reduce GHG emissions 26-28 percent from 2005 levels by 2025 (the United States had already committed to reductions in the range of 17 percent by 2020 and 83 percent by 2050). If the new target is achieved, U.S. emissions in 2025 will be lower than they have been in more than 40 years. This would require approximately doubling annual GHG reductions from 1.2 percent from 2005-2020 to 2.3-2.8 percent from 2020-2025. How does the new target compare to the current U.S. emissions trajectory? 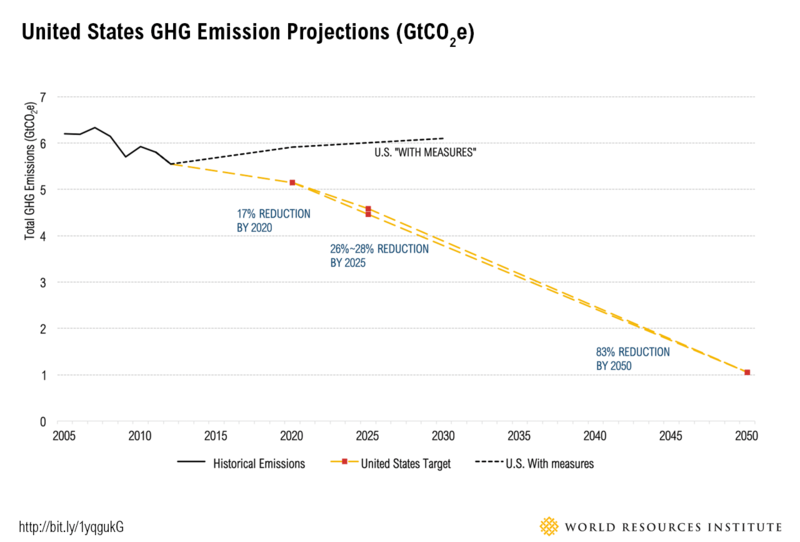 The new 2025 target will require the U.S. to reduce emissions below its current trajectory. U.S. government figures (“with measures” scenario in the figure) demonstrate that as of 2012, the U.S. was not on track to achieve even its 2020 target. Since then, the United States has announced – but not yet implemented – important new policies, including standards for existing power plants and other elements of the President’s Climate Action Plan. According to the Rhodium Group, the U.S. would achieve its 2020 target only if it pursues these measures aggressively. To hit the 2025 target – which further accelerates reductions beyond 2020 – the U.S. will need to double down on these and additional measures. What targets has China adopted? China has announced its intent to peak carbon dioxide emissions around 2030, and to strive to peak earlier. The announcement did not specify at what level China’s emissions would peak, though multiple scenarios that peak around 2030 show peak emissions around 10 billion metric tons per year. China also plans to increase the share of non-fossil fuels in primary energy consumption to around 20 percent by 2030. China had previously pledged to reduce carbon emissions per unit of GDP by 40 to 45 percent from 2005 levels by 2020, as well as increase the share of non-fossil fuels for energy to around 15 percent. How does the new target compare to China’s current trajectory? Scenarios indicate that to peak in 2030, China will have to act quickly to implement new policies. While China has not specified the rate at which it will change its emissions trajectory or the level at which it will ultimately peak, GHG emission scenarios provide an indication. Researchers from MIT and China’s Tsinghua University, as well as the International Energy Agency (IEA), find that by continuing current efforts to reduce carbon intensity, emissions will level off between 2030 and 2040 at approximately 12-14 billion metric tons per year. A move to peak emissions by around 2030, then – which corresponds with a peak around 10 billion metric tons in the MIT-Tsinghua and IEA scenarios – improves on the current trajectory. Scenarios that show China peaking in 2030 assume near-term action by China. 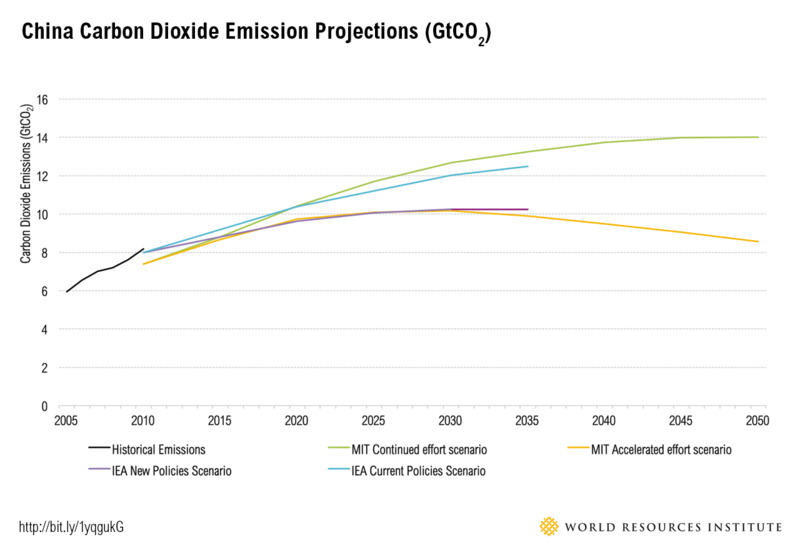 For instance, the MIT scenario assumes a carbon tax will take effect in 2015. Will these new targets keep warming below 2 degrees C? Parties to the United Nations Framework Convention on Climate Change (UNFCCC) have agreed to a goal of limiting global warming to 2 degrees C (3.6 degrees F) in order to avoid the worst impacts of climate change. However, Earth’s atmosphere doesn’t care where these reductions occur, so whether reductions are adequate ultimately depends on the long-term GHG trajectories of the U.S., China and all other nations. Several GHG projection scenarios (such as those from LIMITS and IEA) offer a range of pathways for the U.S. and China that are consistent with supporting a global effort to limit temperature rise to 2 degrees C at the lowest possible cost. These scenarios assume aggressive policies — most importantly, an increasing price on carbon — are implemented by both countries, causing emissions to rapidly decline through 2050. So it’s going to take more effort for the U.S. and China to achieve a long-term 2-degree-C trajectory. However, the potential to cut carbon emissions at the lowest possible cost is only one way to determine what each country has to do. Other considerations, such as historic responsibility and per capita emissions, give different results on rates and shares of reduction. For example, a study by EcoEquity and the Stockholm Environment Institute presents illustrative emissions trajectories guided by a range of equity considerations. This analysis indicates China’s emissions should peak immediately and decline rapidly after 2015, but other countries would fund a significant share of these reductions. U.S. emissions would drop steeply to below 4 billion metric tons of carbon dioxide equivalent in 2025, and the United States would also finance significant mitigation in developing countries. To limit warming to 2 degrees C will require enormous collective effort, especially by the world’s largest economies. China, the United States, and the EU have gotten the ball rolling by announcing their targets, and as the world’s top three emitters, the pressure will stay on them to deliver the most ambitious reductions possible. The challenges are not trivial: China will have to cap coal use, scale up renewables and efficiency, and reconfigure fossil resource and carbon pricing. The U.S. will have to strongly regulate existing power plants, and take action across all other sectors at the federal and state level. In addition, it will be important to track and report progress on these targets and actions using a common approach to ensure an accurate and consistent assessment of the progress and inform the next phase of mitigation goals. But success on these points, combined with declining technology costs and changing demographic trends, could allow these countries to deliver more than what they have pledged. It is significant that all three of these major economies have left the door open to further reductions: China by noting its intention to try to peak before 2030, the EU by indicating it will achieve “at least” a 40 percent reduction, and the U.S. by aiming at the more ambitious end of its proposed range, with the potential to exceed it. Optimally such strengthening should occur before the end of next year’s UNFCCC meeting in Paris. Now it is up to these countries to give more details on what lies behind the numbers by the first quarter of 2015, as agreed in the UNFCCC, and for the rest of the world to join in.